The house has doors at opposite ends of the four sides to utilize natural breezes to cool the house during the mild months. A metal roof on the wrap around porch keeps hot summer sun from beating down on the comfortable rocking chairs. The field stone porch floor helps keep the space under the porch roof cool. 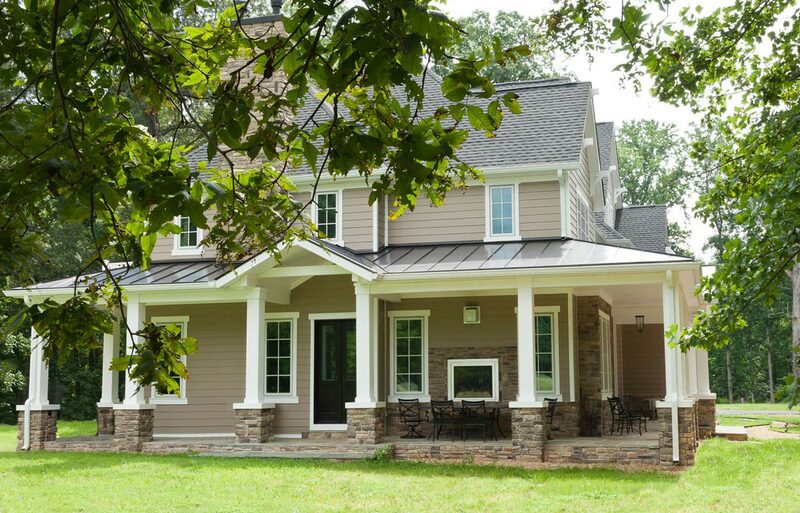 The exterior is made to withstand the elements for years to come with field stone porch floor, Hardie-plank, stone veneer accents, Azek trim and metal roofing on the lower pitched porch roof. One of the principals of Bremen Builders originated, provided design assistance and managed the entire process of building a partial shell while associated with another firm. Clients decided to follow aforementioned principal to Bremen Builders to complete all interior and some exterior finish work. 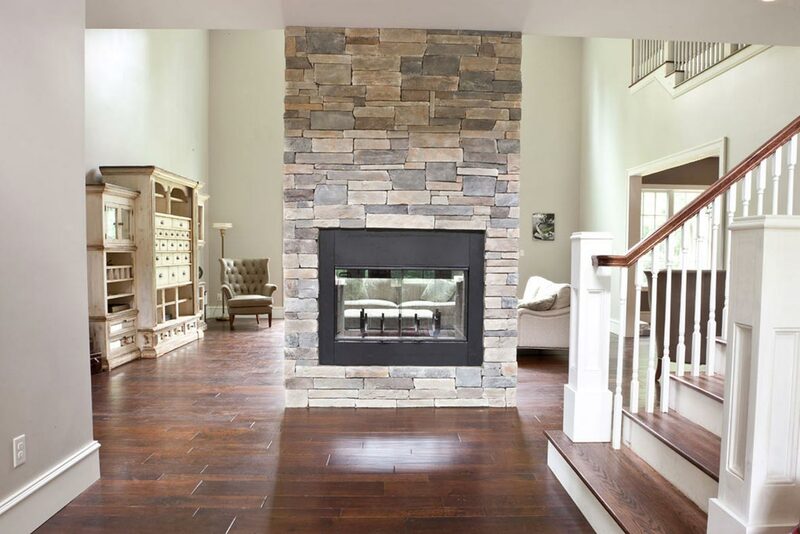 This is the foyer POV with a see through fireplace set in a tall 2 story stone chimney. The custom staircase leads to the second floor walkway. 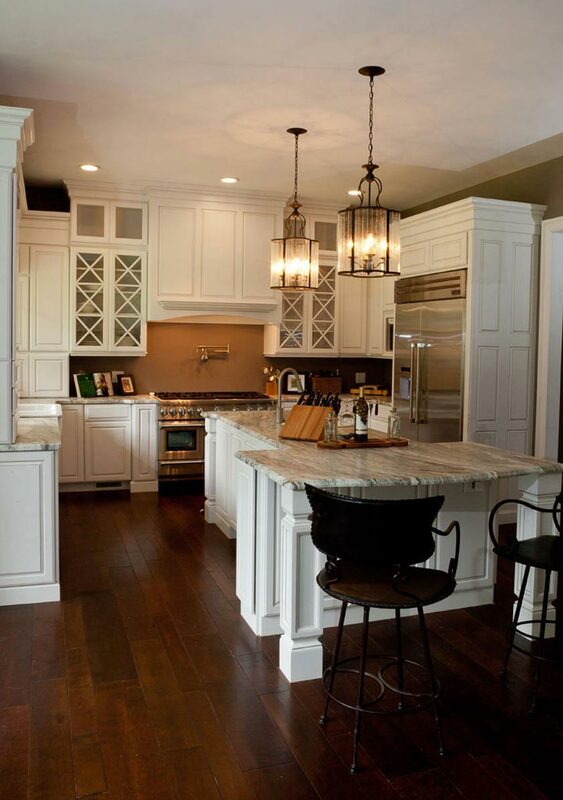 This kitchen was designed for entertaining friends and family with plenty of room around the island and breakfast nook. 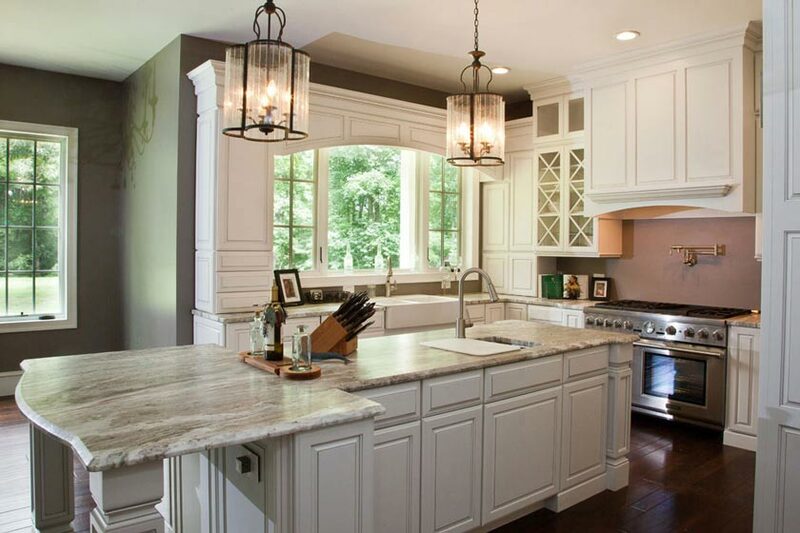 A dimpled quartz counter has the same effect on all who touch it; a need to keep touching it. 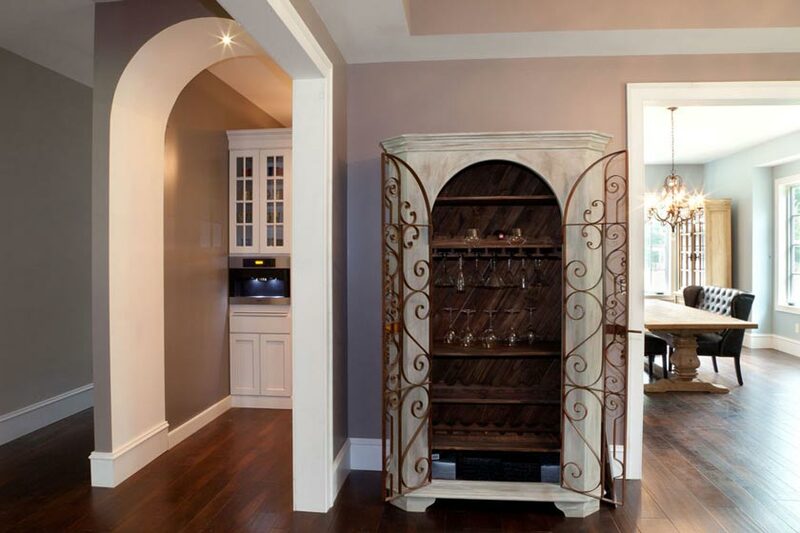 The cabinets have a pewter glaze which matches well with the colors in the counter, wall and floor. The Thermador stove is professional grade with 6 burners, griddle and steam oven. Over the stove is a pot filler and a powerful exhaust fan. There is an apron sink beneath the window and a prep sink in the island. All recessed lights in the house are CREE dimmable LEDs. The Thermador side by side refrigerator/freezer is counter depth and the stove is professional grade with 6 burners, griddle and steam oven. The over hang at the end of the island can accommodate 4 people and is a comfortable place to check email while having a glass of wine. Looking into the butler's pantry from the long hallway shows the vast amount of storage this room has. 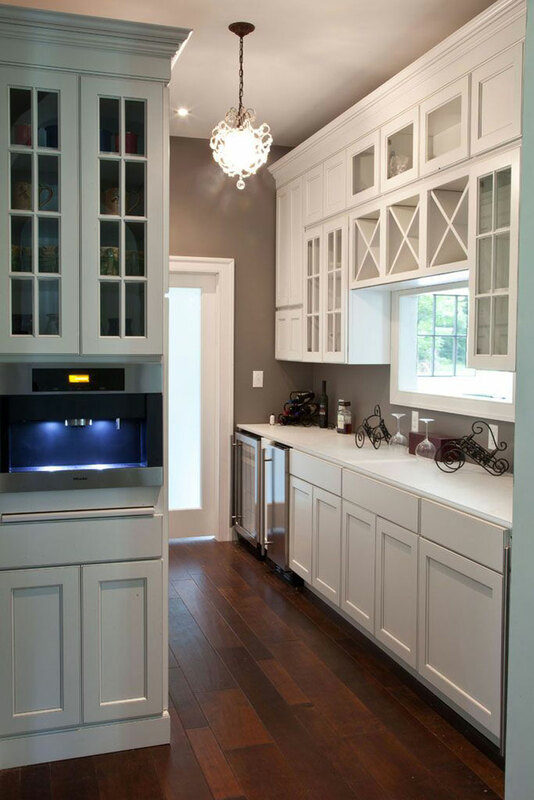 Behind the Miele plumbed coffee/espresso machine is a full row of floor to ceiling cabinets. To the right is the pass through to the dining room, a beverage cooler and ice maker. The frosted glass door which brings in lots of natural light is close to the side exterior door and convenient for unloading groceries. Prep area, wine and dine! View from foyer and sitting room shows arched entry to the butler's pantry, wine and glass cabinet and dining room to the right. West elevation of the house with a wrap around porch and see through fireplace into the living room. During the winter the glass on the see through fireplace allows just enough heat to make it comfortable sitting outside with a cup of hot chocolate watching the snow flakes fall. 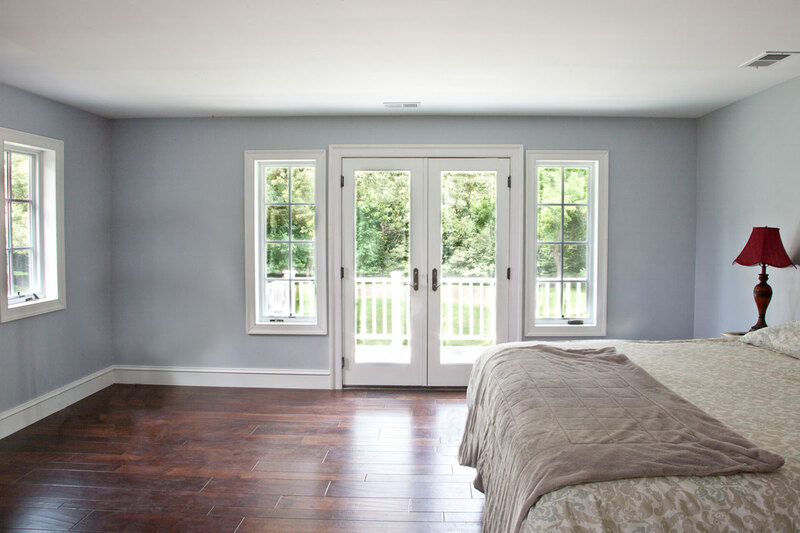 A glimpse of the master bedroom doors leading to the private deck. Missing are Frankie and Beans (dog and cat) that were on the throw at the bottom of the bed just before we took this picture. We could have used a pet wrangler that day. 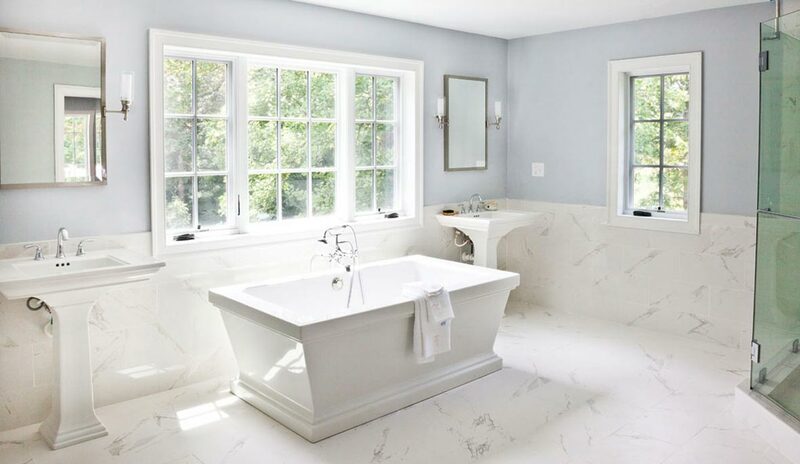 Master bathroom with a soaking tub as the focal point and his and hers pedestal sinks. Large shower stall is to the right. This shower has 4 body sprayers, a rain head and hand held shower wand. The glass door swings both ways because many people pull a door open to enter. When finished with their shower they can open the door inward and pull the towel off the exterior towel bar/door handle. Drying off in the shower reduces the amount of water that drips onto the bathroom floor. 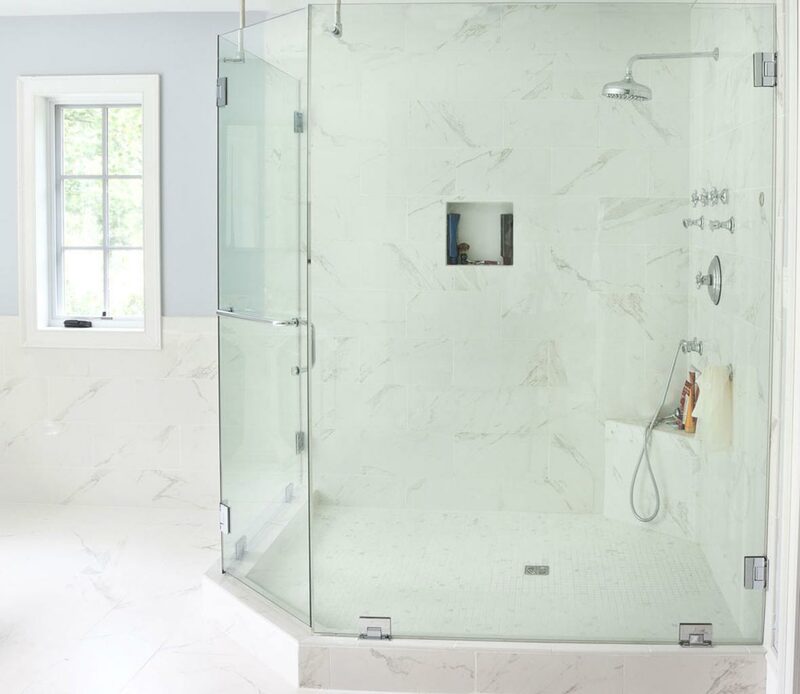 Most shower glass installers rest the glass on the (usually flat) curb and apply a bead of silicone to keep the water from going out to the bathroom floor. As with other projects, we sloped the curbs in the 3 shower stalls in this house inward and the glass walls are raised about 1/4 inch above the tile curb so air can flow easily which helps dissipate moisture after a shower. The water doesn't splash out because the curb is sloped up on the outside of the glass. And more importantly since there is no silicone where the water can sit and grow mold this configuration makes cleaning the shower easy. 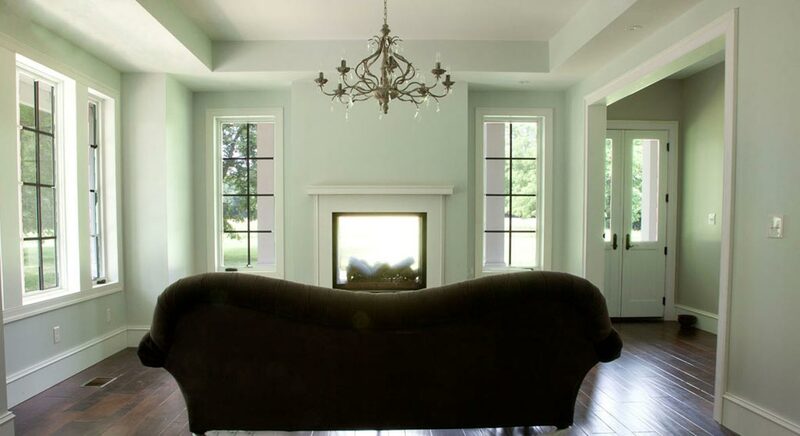 This room was originally going to be a library but turned into a Gentleman's sitting room. 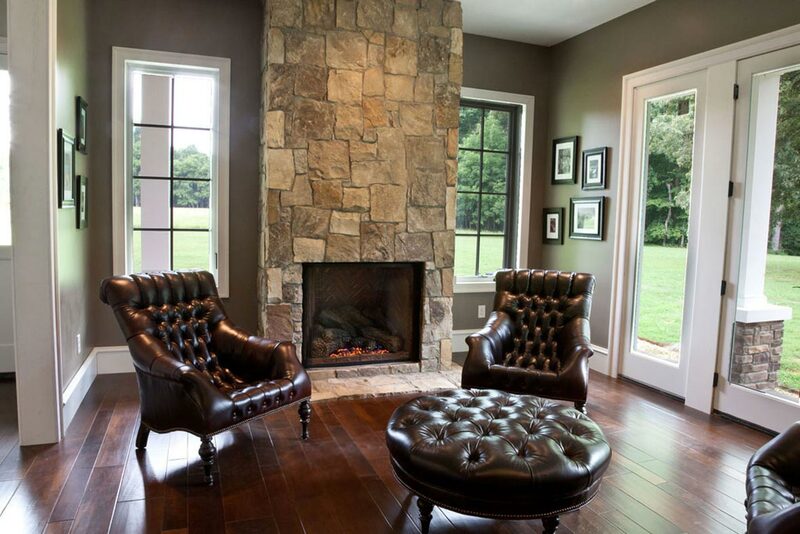 The fireplace is gas with a remote control to raise and lower the flame and fan which blows heat in through the vents. This room is on the west side of the house facing 4+ acres which during the Civil War was occupied by both Confederate and Union forces. 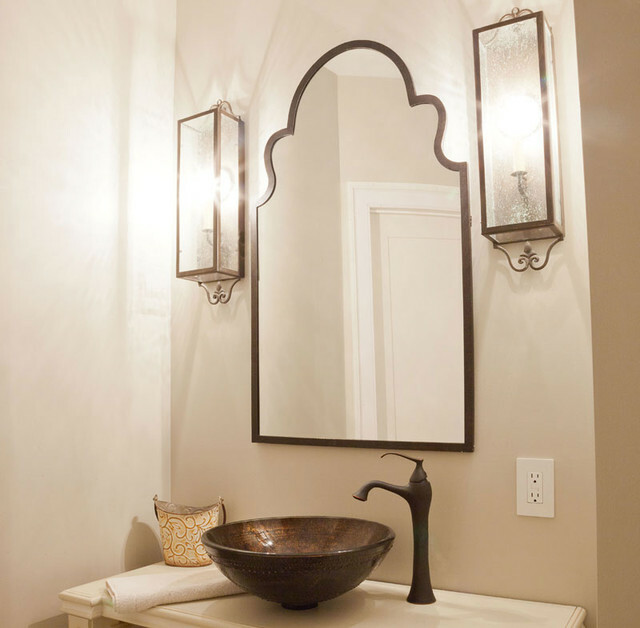 The homeowner asked us to build this vessel sink vanity from a desktop she found in an antique shop. This new house replaces an old farm house which was built in 1863 by the owner's ancestors while their property was being occupied by the a Confederate regiment. That house had been added to many times in the 19th and 20th centuries and only a few hand hewn beams remained of the original building when we dismantled it. The property, which consists of 80 acres has been in the family since the 1700s. During the Civil War both Confederate and Union troops used their land as an encampment. It is the homeowners' wish to have this house last another 150 years. With that in mind this house was built to Earthcraft energy efficient standards; (earthcraftvirginia.org). It is framed using 2x6's, Zip system water resistant sheathing was used on the exterior walls and roof, spray foam insulation is on all exterior wall cavities and ceilings, energy efficient windows and doors were installed. PEX plumbing was used to feed water to each fixture and two 98% efficient tank-less water heaters were installed. 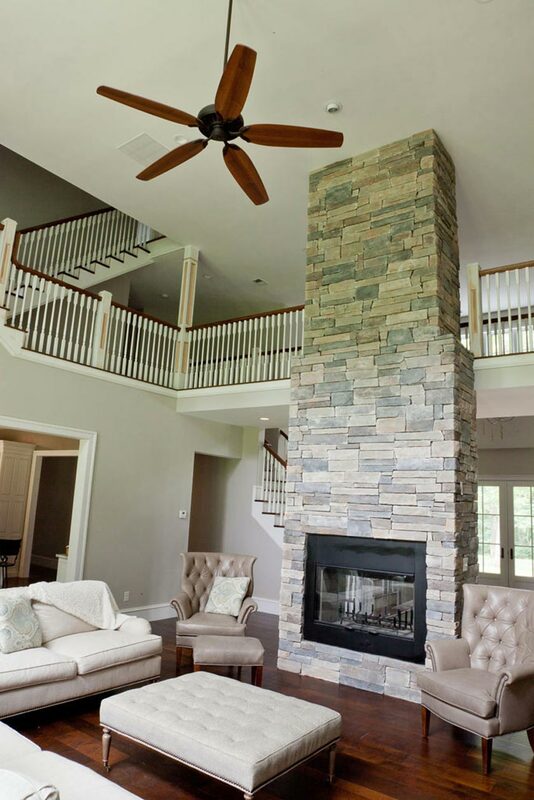 The heating and cooling is done by 3 heat pumps strategically placed to handle the heat and cooling loads of this house. In this region of the country, homes typically need air conditioning for more months of the year than they do heat. The heating system has been future proofed with coils on top of the air handlers to accept hot water from solar collectors or the Central Boiler house in the back yard (used with the old house). It is the homeowner's goal to install solar photovoltaic modules in the future to power the heating and cooling of the house.